Thatch is the buildup of organic material between the actively growing blades of grass and the soil. Severe thatch can have a hydrophobic effect and will not allow water to pass through from the surface to the soil below. 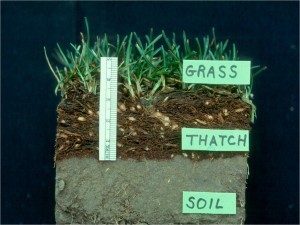 Severe thatch will also negate the effects of fertilizer, as any added nutrients will not be able to reach the root zone of your lawn. Therefore, regular dethatching of your lawn is essential for optimal lawn health, as well as water and fertilizer conservation. 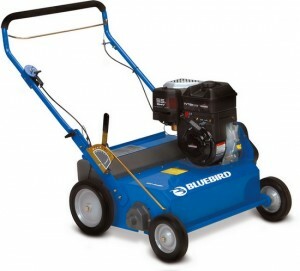 Spring is the ideal time to dethatch a lawn. Depending on the weather, aim for April to mid-May. Use a mechanical thatcher to remove the thatch. To use a mechanical thatcher, set the flail at or above ground level. Make two to three passes over the entire lawn, each in a different direction. Remove all generated debris between passes. Scalp down any remaining grass. Fertilize with Nitrogen at 1-2 lb Nitrogen per 1000 square feet. In a lawn with severe thatch, aeration will be required to sufficiently break through the thatch layer and overseeding may be required. In addition to mechanical thatch control, applying the principals of biological thatch control will help to optimize your lawn health. Biological thatch control includes maintaining soil pH between neutral and slightly acidic – a soil test kit will assist you in determining your soil pH. Keep root zones well aerated – this can be completed with a hand aerator or an aeration machine. Be sure to incorporate any generated cores using your lawn mower; cores should not be removed as they add valuable nutrients to the lawn. Reducing lawn use during wet weather will prevent compaction, and help to maintain a well aerated root zone. A healthy earthworm population will also go a long way to promote good soil aeration. Protect earthworm populations by avoiding excessive use of fungicides and insecticides. Mulch mowing is a great way to save space in your yard debris bin while reducing fertilizer needs and keeping your lawn well fed. Don’t remove your lawn clippings – incorporate them! If you follow all of these steps, you will achieve a healthy, strong lawn with minimal effort.